Swidden agriculture, also known as shifting cultivation, refers to a technique of rotational farming in which land is cleared for cultivation (normally by fire) and then left to regenerate after a few years. Governments worldwide have long sought to eradicate swidden agriculture, which is often pejoratively called ‘slash-and-burn’, due to a mistaken belief that it is a driver of deforestation. There are a huge number of different farming practices that are lumped together under the disparaging term ‘slash and burn’, otherwise known as swidden or shifting cultivation. It is also used to describe the rampant encroachment of farms and ranches into forested areas, first by felling the trees, then burning the stumps and then planting. This invasive ‘pioneering’ bears no real resemblance to the careful nurturing and rotating of plots practiced by generations of tribal peoples. But under-informed policy-makers have lumped all such practices together and portrayed them as an environmental evil. In fact, across the ecologically vital forests of Amazonia, Borneo and Central Africa, tribal peoples have developed complex farming systems based on clearing land for a short period and then leaving it to return to forest for a longer period. This type of “slash and burn” is better referred to as “swidden agriculture” or “shifting cultivation". Some argue that part of the immense diversity of these forests is due to shifting cultivation practices, rather than endangered by them. Fire is one tool that is carefully used in these farming systems, which have been developed over generations to be appropriate to both the land and the community. In the mid to late 20th century, swidden was seen as a disastrous activity which was destroying forests that should either be used for conservation or logging. The impacts of mining, dam building, plantations and the voracious demand for timber were underplayed, whist swidden was held up as conservation’s enemy number one. Several governments banned or severely restricted the practice whilst allowing vast areas of forest land to be cleared for logging, plantations and biofuel production. This attitude prevails. Mining company, Vedanta Resources, for example has claimed that the ‘Dongria Kondh tribe’s agricultural practice of shifting cultivation results in large-scale destruction of forest and thereby bio-diversity’ – not only incorrect but also somewhat ironic coming from the company that seeks to dig a vast mine in this biodiverse hill range. Recently, scientists have realised that these farming systems, ‘maintain very high levels of biodiversity while providing livelihood for populations in tropical forest areas worldwide’. In the Peruvian Amazon, scientists have recorded an average of 37 species of tree on swidden plots and records show over 370 species are supported in the territories of the Karen swidden farmers in northern Thailand. Far from being responsible for destroying biodiversity, tribal swidden systems are being recognised as having contributed to the diversity of forest areas and to maintaining the ecological value of these areas. 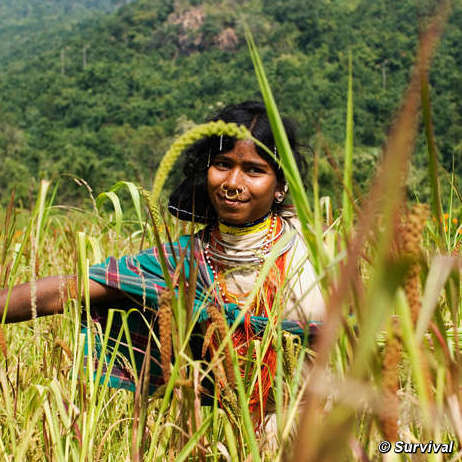 This shows that tribal peoples are better at looking after their environment than anyone else. The Wanniyala Aetto of Sri Lanka are a forest people who have traditionally practiced a form of agriculture called chena cultivation. The forest plots are cleared for one or two years and then left to rest for seven or eight. The plots look untidy, with a multitude of different plants coexisting, rather than neat beds of specific crops, but this diversity is the key to both their ecological value and their economic importance to the Wanniyala Aetto. Much of the world’s ‘primary’ forest has in fact been historically managed under shifting cultivation. Much ‘secondary’ regrowth is rich in biodiversity as the clearings encourage the growth of a range of plant species which in turn attract a diversity of birds and animals. During the fallow periods, the regenerating plots continue to provide for the community – from animals to hunt to a range of forest products including medicines, fibres and fuel. In these communities, forests are a valued part of their livelihood system – rather than something to be cleared to make way for fields. The Jummas – a group of several tribes in the Chittagong Hill Tracts of northern Bangladesh – are named after Jhum, their form of shifting cultivation. The Jumma tribes have developed this farming system to suit the rugged, hilly landscape in which they live. The Jhum system was an effective, sustainable system that provided for the needs of the Jumma tribes for generations. But the Jumma have been squeezed into an increasingly small area, first by the submergence of land when the Karnafuli River was dammed, then by the influx of thousands of Bengali settlers who have been encouraged by the government to settle in the Hill Tracts. The Jummas and their Jhum cultivation are under threat from both the settlers and the Bangladesh army, exacerbated by the severe restrictions that have been placed on the Jumma tribes’ access to, and use of, their forests. They are forced to shorten their fallow periods and so their yields from the land are decreasing, leading to both food shortages and economic hardship. An argument against swidden agriculture is that it does not yield sufficiently to feed a burgeoning population. But the quality and diversity of the nutrition that is extracted from swidden plots is typically higher than from intensive agricultural systems. In one Amazonian area, less than 5% of the forest land is cultivated at any one time, the rest is in varying states of regeneration. Many of the areas where swidden agriculture is practiced are unsuitable for permanent cultivation because the soils are too poor. By moving their plots from year to year, tribal communities have developed ways of ensuring a diverse and sustainable supply of food, rather than high, but short-term, yields. As swidden is pushed out, new agricultural and biofuel-farming systems go in, which are typically far less biodiverse, alien to local people and beyond their control, and far less able to support local communities – either in terms of current livelihoods, or nutrition or future sustainability. This form of ‘progress’ is devastating for tribal communities.